IDF Chief of Staff Lt.-Gen Benny Gantz officially informed Noam and Aviva Shait that their son, captive soldier Gilad Shalit, is set to return home next Tuesday after five years in Hamas captivity. Gantz visited the Shalit family home in Mitzpe Hila on Thursday, ahead of the impending prisoner swap. The IDF Chief briefed the family about the details of the deal, explaining that the first phase of the swap will take place on Tuesday: According to the agreement, Gilad will be flown to Egypt and from there to the Tel Nof Air Force base – where his family will finally reunite with him. 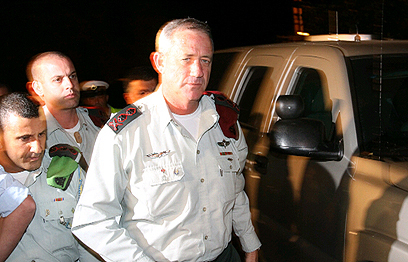 The IDF chief declined to speak to the media upon leaving the Shalits' home. Prime Minister Benjamin Netanyahu announced on Tuesday that Hamas had finally agreed to a prisoner exchange deal: Israel will release 1,027 Palestinian security prisoners in return for Gilad Shalit's safe return. The deal will take place in two stages: The first stage, which is set to take place within a week, will see 450 prisoners released parallel to Shalit. Shalit will be transferred to Egypt and from there to Israel. The second stage, scheduled to take place in two months time, will see 550 additional prisoners released. Shimshon Libman, who heads the Shalit campaign, told reporters that "the chief of staff met with the family… He probably discussed the preparations being made ahead of Gilad's return. "I hope that we'll have Gilad back home by Simchat Torah night, barring any problems." Also on Thursday, the International Red Cross offered to play a neutral intermediary role in the prisoner exchange. "We are talking to both sides about our offer. We have offered our services as a neutral intermediary to both sides," Red Cross Spokesman Marcal Izard said. Popular Resistance Committees' Spokesman Abu Mujahid said Thursday that Shalit's captures will release a video documenting his time in captivity, after the prisoner exchange is completed. "The video will show that he was treated well and with respect, as demanded by the Islamic dogma," he said. See all talkbacks "Gantz: Gilad to return on Tuesday"